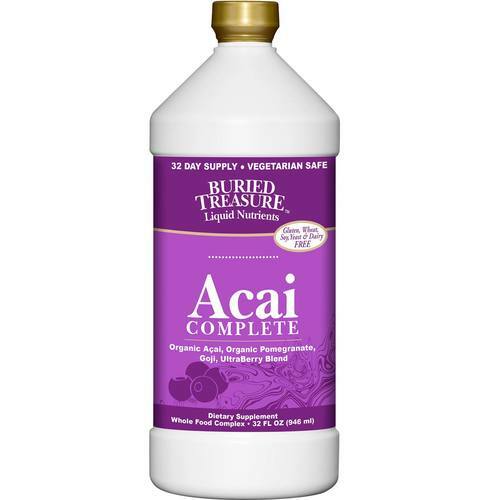 Acai Complete is a whole fruit complex made from Organic Brazilian Acai (Amazonian palmberry), Organic Pomegranate, and Himalayan Goji Berries. Acai is a complete food concentrated with protein, fiber, vitamins, minerals, and antioxidants. This little berry grows wild in the Amazon Rain forest of Brazil and is one of the most nutritious and powerful foods in the world. Acai Complete combines the wonders of Açaí Berries with antioxidant rich Pomegranate, energy-producing Goji Berries and UltraBerry Blend with Green Tea (caffeine free) making this Acai Berry Juice the perfect vitality drink. Acai was recently featured on the Oprah program as being one of the top super foods for age -defying beauty. Advertências: Refrigerate Acai Complete After Opening. Keep Acai Complete out of the reach of children. Notas: The most complete Superfruit Complex available! The Acai berry is a rich source of antioxidants; especially concentrated in "anthocyanins" shown to support cardiovascular health. Acai berries contain more "anthocyanin’s" than red wine. 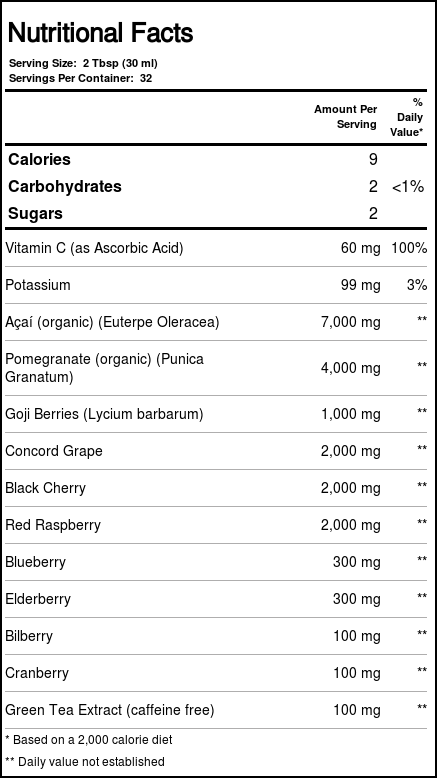 Acai berry has a reputation as one of the world’s most potent "super foods". Acai Complete supplies disease fighting pomegranate which contains polyphenols and anthocyanins. Acai Complete provides Goji Berries, long revered for health benefits; this alkaline berry contains 22 phytonutrient compounds supporting many of the body’s systems. Recomendações de uso: Shake well before each use. Adults should take two (2) tablespoons daily. As avaliações dos clientes postadas abaixo são baseadas em experiências individuais e NÃO representam necessariamente os resultados esperados ao usar/tomar Buried Treasure ACAI completa 32 fl oz. Esses resultados podem ser atípicos e você não deve necessariamente esperar ter os mesmos resultados. Os resultados reais podem variar. Eu não posso dizer o suficiente sobre o quão bom é esse material. Estou ansioso para levá-lo e sentir revitalizado depois de um mês ou dois de levá-lo!